Sisters always want back after giving, they never give and leave. 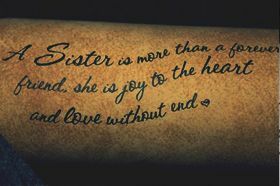 Sisters is probably the most competitive relationship within the family, but once the sisters are grown, it becomes the strongest relationship. Friends change. Lovers leave. 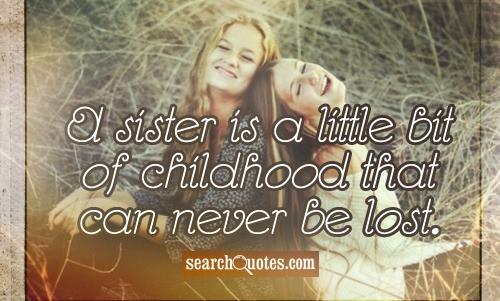 Sisters are eternal. The only reason god didnt make us sisters is because one mom couldn't handle us both. 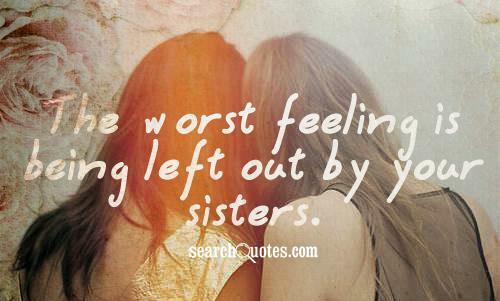 The worst feeling is being left out by your sisters. Friends are like sisters but like sisters they grow up, move out and become apart. For there is no friend like a sister, in calm or stormy weather, to cheer one on the tedious way, to fetch one if one goes astray, to lift one if one totters down, to strengthen whilst one stands. Sisters are considered as female siblings or females to whom one is connected by some blood relation or circumstances of birth. Sisters are really fun to be with and one can enjoy sharing one’s secrets with one’s sisters. Being females, sisters are always tender-hearted and affectionate towards their siblings, be it their brothers or sisters. Specially, an elder sister who has to take up the responsibility of all younger siblings, becomes a kind of mother to them and provides them motherly affection along with sisterly affection. Sisters must be respected, revered and valued. In India, the festival of “Rakhi” is celebrated. Sisters tie a piece of thread called Rakhi on the wrists of their brothers. The brothers promise to standby their sisters forever, whenever needed.